Momma Told Me: Eating Healthy is a Job. Growing up Momma called me her job; not in a negative manner, but in a 'raising a family and keeping the dog from eating the cat is real work' sort of way. As an adult I know just living life can be a challenge. Sure I am grateful for every single moment, but does the shower drain have to back up every week? And isn't eating healthy a challenge on it's own without the added uphill battle of inherited obstacles (think high cholesterol and a history of diabetes)? When it gets down to brass tacks there's a million and one ways to live this life, and no right or wrong way. It's a never-ending balance of memories made and practical decisions. That's why, whether we'd like to admit it or not, we've almost all been on some sort of 'diet' at one point. No, a diet isn't about losing weight, though that could be the goal for some, a diet is about re-centering one's food intake to balance out the splurges. Whether you're cutting back on caffeine because it keeps you up all night, or increasing protein to build muscle in your daily workout. There's no pill we can pop to provide all the necessarily nutrients and essentials; and if there was I doubt any of us would take it, because eating the food (to consume those nutrients) is half the fun! Eating healthy, balanced, or even 'low calorie' meals don't mean you have to cut the concept of dessert, or forgo multi-course meals. In fact, most experts encourage you to consume more than one course every meal. Sure, you can throw all of the ingredients in a skillet and call it an omelet, but consuming the bacon as strips, the veggies pan seared, and the eggs over-easy will cause you to consider your portions more. Not only will you feel more satisfied and full mentally, but you will take longer to consume the meal, thus digesting the food better, and feeling full sooner. Back to life being complicated; I certainly agree building a 5 course meal, 3 times a day, is near impossible for even individuals, let alone those with families to care for. Not only can it be time consuming to make multiple courses, but the cost can really add up when you consider fresh ingredients. That's precisely why I always keep my Lean Cuisine #FrozenFavorites on hand. Not only can I choose from over 100 ready-in-minutes entrees, appetizers, and meal aids spanning multiple flavor profiles, but I can monitor what I'm eating with a simple glance. My favorite entrees are usually just around 300 calories per serving, leaving me plenty of room to add an extra course, and even indulge in a low calorie dessert like Skinny Cow frozen novelties. You might be scratching your head, a little skeptical- frozen meals have a bad wrap in health circles; but we've come a long way from the over-processed trays of Momma's time. Frozen convenient foods are taking more and more strides to cater to the busy, health minded, consumer. That's what Lean Cuisine is all about, making mealtime a reality for those strapped for time, while offering a wide range of flavorful and nutritious 'from freezer' products. 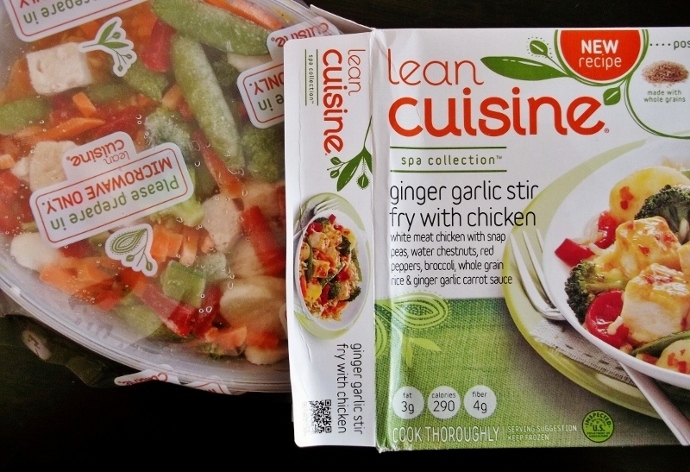 And buying my Lean Cuisine #FrozenFavorites just got even more affordable, with a recent price drop at Sam's Club. Now through February great buys such as the Skinny Cow 20 Variety Pack and Lean Cuisine Italian Favorite's 4 Pack drop a dollar off their already low big buy price. I can also pick up a 6 Pack of Lean Cuisine Asian Favorites meals for just $9.98 (previously $11.25); an amazing deal at just $1.66/meal! These Sam's Club exclusive Lean Cuisine bundles pair their Italian and Asian best selling entrees for convenience and affordability that I could rarely match clipping coupons and fighting lines elsewhere. We already eat the 3 Asian favorites, Sesame Chicken, Ginger Garlic Stir Fry with Chicken, and Chicken Teriyaki Stir Fry often, so buying them bundled is a no brainer! I'll admit, of the 3 Lean Cuisine Asian Favorites my favorite happens to the the Sesame Chicken, ringing in at 330 calories (the highest of the trio, with the lowest being a mere 220). It just so happens to be the one that also has the least amount of vegetables. 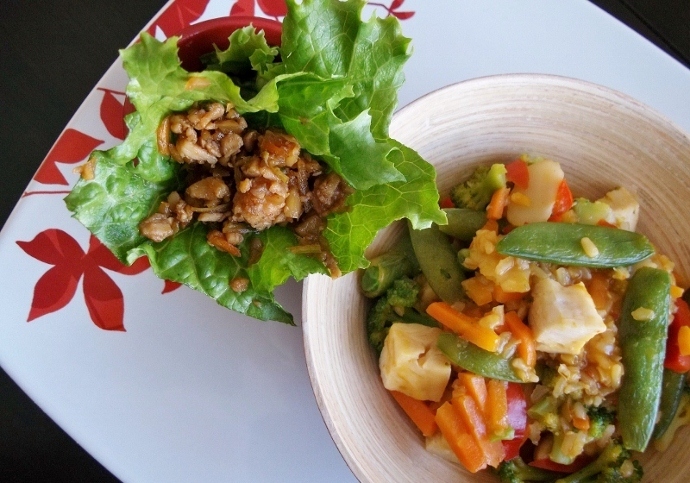 Since 330 is still a good target for dinner entrees, I like to pair the Sesame Chicken meal with an equally light side that feels filling, but is primarily nutrient rich veggies; Mandarin Chicken Wraps. Much like many of my #FrozenFavorites, home made sides, this is one I can prepare in bulk and keep refrigerated for a week, or even freeze for future use. I make large batches of the Mandarin Chicken Filling, and treat myself to some crisp and naturally sweet wraps when I catch the fresh greens in stock. 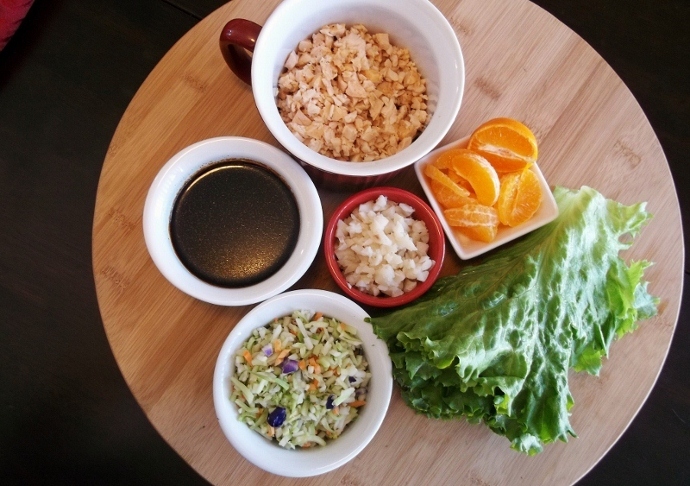 While I choose to use the garlic infused Original Recipe Yoshida's Sauce, in addition to the juice of fresh Mandarin Oranges, an even lower calorie variation of this inspired side can be achieved with the substitution of 2 parts Low Sodium Soy and 1 Part Low Sodium Teriyaki Sauce. Whichever way you choose to make it one thing is sure, make extra, because this will fly out of the bowl fast! 1.) Prepare a skillet by bringing to Medium-High heat and add Diced Veggies and Water Chestnuts. Allow to cook for 1-2 minutes, constantly tossing and stirring. 2.) Reduce to Medium Heat and add juice of 2 Mandarins. Stir and add diced Mandarins. Cook an additional 2-3 minutes, until vegetables begin to turn golden/brown lightly. 3.) Add chicken and Yoshida's Sauce. Combine until fully coated. 4.) 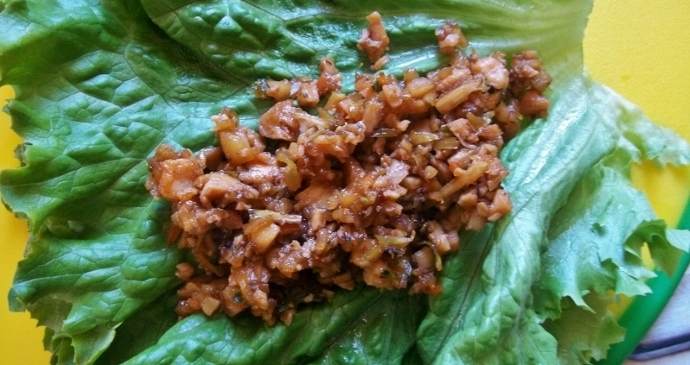 Remove from heat and allow to chill for 2-3 hours before spooning into lettuce leaves. 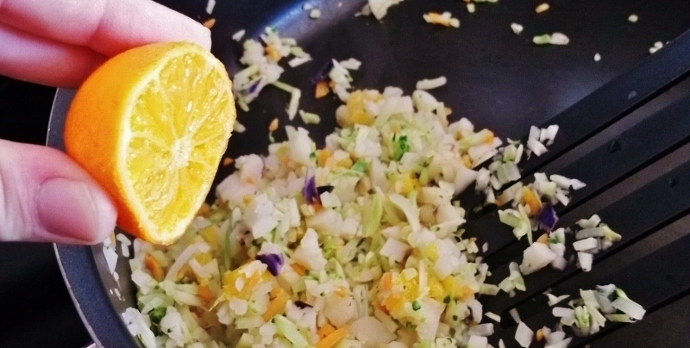 If you're rally looking to save time creating this Mandarin Chicken Wrap Filling you can usually spy a great deal on local varieties of Bagged Chopped Salad at Sam's Club. The particular blend I used this time was Asian cuisine inspired and included dressing, sunflower kernels, and bacon packets, which I set aside for use in a later meal/recipe. While 1 bag will yield double the recipe above, I usually try to 4x the recipe, refrigerating and freezing the filling for use throughout the week as a quick side to my Lean Cuisine entrees. Because this side is served cold, it's easy to toss in a tote with a cooling pack and enjoy with my Lean Cuisine at work, or the office. I also used canned, pre-sliced, Water Chestnuts which are extremely affordable and really bring an engaging crunch to the meal. Studies indicate varied textures are also integral in a satisfying, and filling meal. How you serve the filling, within the wraps, is entirely up to you. We like to simply spoon the filling onto a leaf and roll it up. It's messy, but that's half the fun! Softer leaves, like Butter Greens will fold and roll even easier for a more contained serving. The Italian favorites Lean Cuisine Bundle (just $6.98/4pk) at Sam's Club features 2 of each, Spaghetti with Meatballs, and Chicken Parmesan. Both are 8g of fat or less, with 300 or less calories at around 10oz of portion a piece. Going 'Italian' is always a struggle for me, especially with #FrozenFavorites that sometimes rely more on carb bases with tomato based sauces. Let's face it, the vegetables are often lacking, and the various sauces in frozen meals can have odd aftertastes. I am here, as a long time consumer, to tell you that I have kissed many toads in the world of frozen Italian Cuisine, and Lean Cuisine offers a hearty sauce they tastes amazing. Where some brands can present the issue of watery, minimal, or even bland sauces, both the Chicken Parmesan and Spaghetti with Meatballs satisfy my cravings. 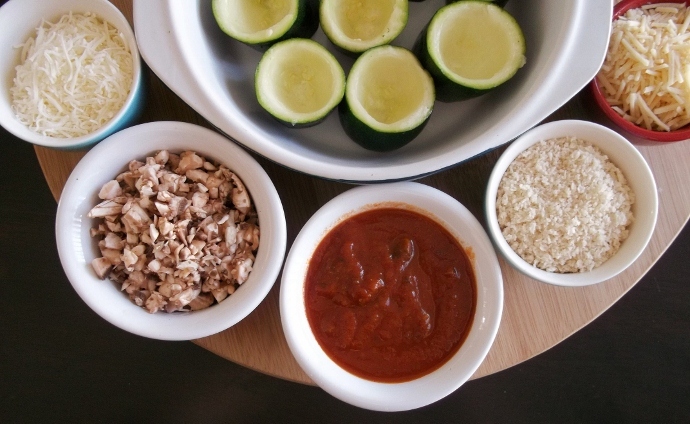 I simply whip up a few of my easy to make Zucchini Bites, and I have a hearty Italian Meal with enough room to splurge on dessert! 2.) Lightly rub the melted butter on the inside of the zucchini bites and sprinkle with garlic salt, if desired. 3.) Dollop a small portion of pasta sauce into the bottom of each bite. 4.) Sprinkle with Parmesan and fill with mushrooms, leaving just enough of a lip for a second dollop of pasta sauce. 5.) Sprinkle with a generous layer of Panko bread crumbs, lightly patting filling down. 6.) Top with a small heap of Mozzarella. 7.) Place on greased cookie sheet, or arrange in non-stick bakeware, and cook for 20 MINS at 375F. Remove from oven and allow to cool 5 mins prior to serving as filling will be hot! I have to say, I cannot stress enough how much simpler the Lean Cuisine and Skinny Cow bundles from Sam's Club have made my weekday lunches. I don't have to compromise variety, and I can enjoy a well rounded, complete, meal for just under $4 (that's including a side and dessert). Nestle Skinny Cows, sold in a two flavor (Vanilla/Cookies and Cream) variety pack come out to less than $.50/sandwich, and are the perfect low sugar solution to my sweet tooth cravings in the afternoon and late night. I'll admit, I don't usually eat my Skinny Cow directly after my meals, because I am already feeling full and satisfied, but I love being able to reward myself a few hours later when the munchies start to creep in. Thanks to Lean Cuisine and Skinny Cow at Sam's Club I can keep my daily calories to around 1600 without any special programs or journals. The nutritional information is right on the package, and the time (and sanity) I save over trying to piece meals together in a pinch is priceless! To learn more about how I developed this healthy eating game plan, check out my Google+ Album. What Daughter Says: Take the guesswork out of healthy meals. Pair a quick and inspired side with Lean Cuisine's #FrozenFavorites, and have calories to spare! I am a member of the Collective Bias® Social Fabric® Community. This shop has been compensated as part of a social shopper insights study for Collective Bias®, Nestle Lean Cuisine and Skinny Cow. #CBias #SocialFabric. First of all I really love your plates. I love that red accent design. Lean Cuisine is really coming up to the plate (excuse the pun) with some really great food options. Thanks for those recipes as I'm always looking for Zucchini recipes. What great photos you take, as always. These recipes look AMAZING! Would you like to guest post for one of my Foodie Friday's sometime? That recipe really sounds good and i have tried the Lean Cuisine sesame chicken and really loved it. Liked it so much, I bought more. Love Asian food anyway. Those Zucchini bites look amazing! This looks amazing! I looooove zucchini. I love the way you plated them--so pretty! These look so yummy! 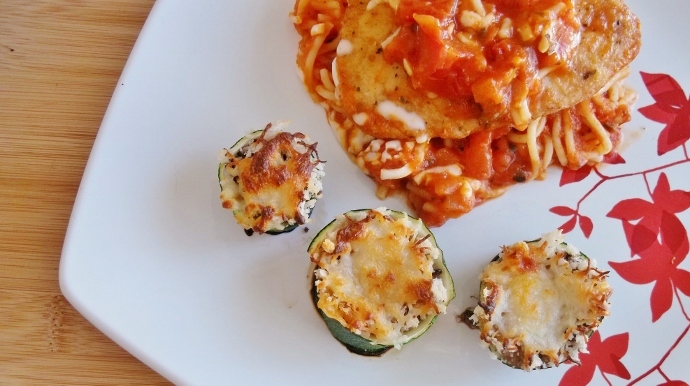 I love the idea of stuffing the zucchini- super cute and healthy! I like the Zucchini Bites recipe. Looks so delicious, too. The Zucchini Bites look great, so does the Skinny Cow!! 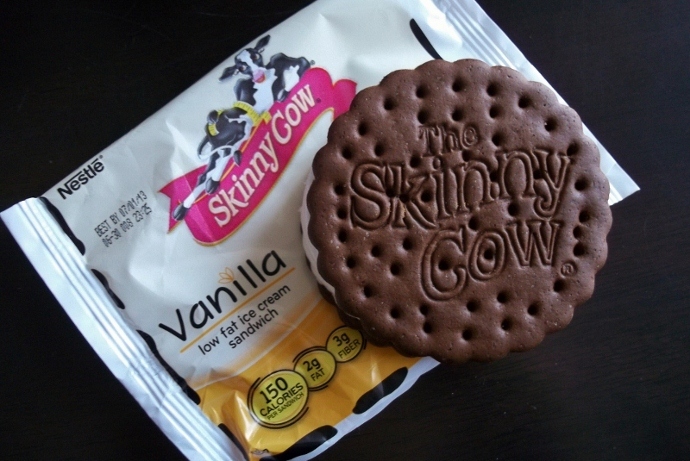 The Skinny Cow now has me craving ice cream! 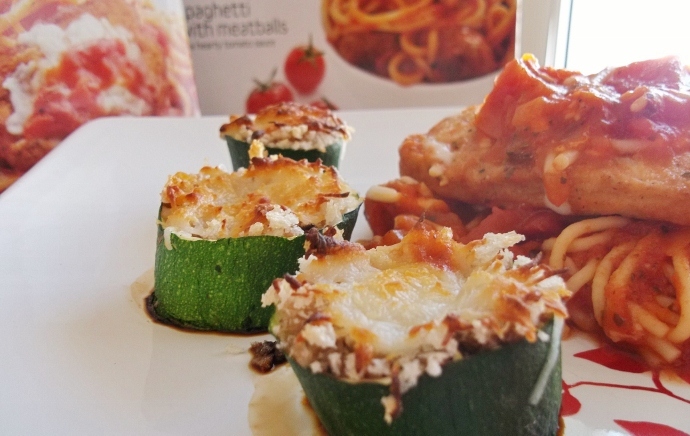 The baked zucchini bited look delicious! This will be great when I have an abundance of them in the garden this summer. I LOVE the recipe for zucchini bites! I love zucchini and this is a great way to fancy it up. The Lean Cuisine looks delicious, the Italian ones need to go on my must try list. Yum! I really need to start eating healthier but Lean Cusine has never looked this good! Great ideas! Thanks for linking up to Friday Food Frenzy! Thank you for the recipes! I often rely on fozen dinners for lunches during the work week. Your sides will definitely make them more filling. Those look tasty and easy. I do not have very much time during the weekdays, but this looks pretty painless! Love the recipes! I like the fact that you are so thorough, down to where to shop for ingredients. Healthy eating is something I dont do much of, but this was inspiring! First of all, Lean Cuisine is the only well, frozen "lean cuisine that I really like. 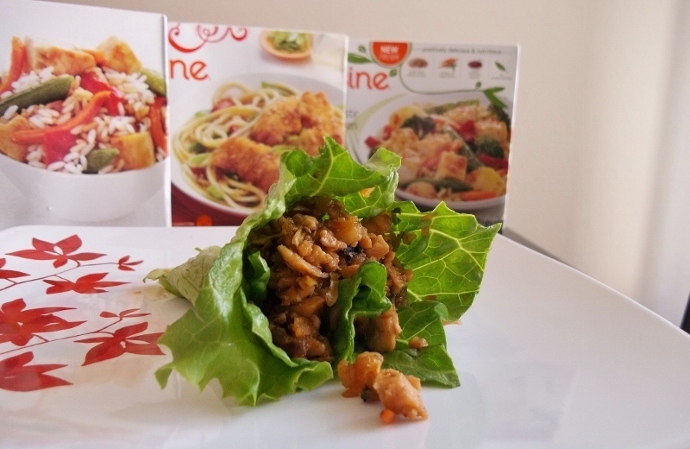 But while we often eat "leftovers" using lettuce leaves as wraps - I never thought of using Lean Cuisine. I'll definitely be trying that especially when the product is on sale!) Thanks for the yummy looking, time and money saving idea! P.S. I agree with others that both your plates and the photos are truly lovely! I was goingto comment on how appetizing the Lean Cuisine looked, especially with your additions...( I'm not a big frozen meal person) but then I got down to the zucc bites...heavenly!!!! Bookmarked your page for that!